Abstract. This investigation examines the effect of different amendments on selected soil physical and biological properties over a 24-month period in two cropland fields. Urban municipal solid waste (MSW) compost and alfalfa residue (AR) were used as different organic amendments at the rates of 0 (control), 10 and 30Mgha−1 to a clay loam soil and a loamy sand soil in a semiarid region. Results showed that the soil improvement was controlled by the application rate and decomposability of amendments and soil type. The addition of organic amendments to the soils improved aggregate stability and consequently enhanced total porosity, especially macropore fraction. The increased soil organic carbon (SOC) and total porosity values as compared to the control treatment were greater in the loamy sand soil than in the clay loam soil. 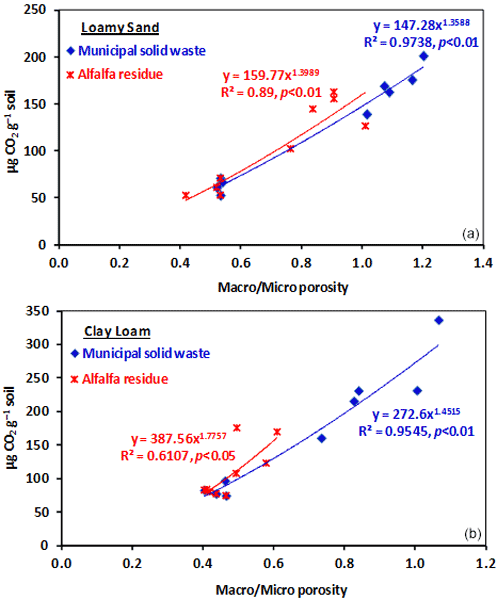 Moreover, compared to the microbial respiration of control plots, the application of MSW resulted in higher values of microbial respiration in the clay loam soil than in the loamy sand soil, whereas the reverse was found for AR. Linear and power functions were provided for the relationships between microbial respiration and SOC in the loamy sand and clay loam soils, respectively. Also, CO2 emission was stimulated significantly as power functions of the total porosity and the ratio of macroporosity to microporosity. However, the soil microbial respiration and carbon storage improved aggregate stability and pore size distribution, and as a response, soil porosity, especially the macropore fraction, controlled CO2 flux. 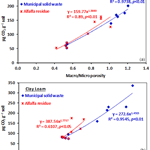 How to cite: Yazdanpanah, N.: CO2 emission and structural characteristics of two calcareous soils amended with municipal solid waste and plant residue, Solid Earth, 7, 105-114, https://doi.org/10.5194/se-7-105-2016, 2016.